3D Printing is a faster, more cost-effective method for building prototypes from three-dimensional computer-aided design (CAD) drawings. 3D Printing provides a fundamental overview of the general product design and manufacturing process and presents the technology and application for designing and fabricating parts in a format that makes learning easy. 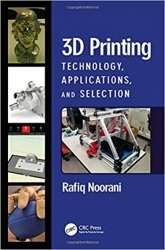 This user-friendly book clearly covers the 3D printing process for designers, teachers, students, and hobbyists and can also be used as a reference book in a product design and process development.